the other day, i stumbled across a recipe for chicken cacciatore. 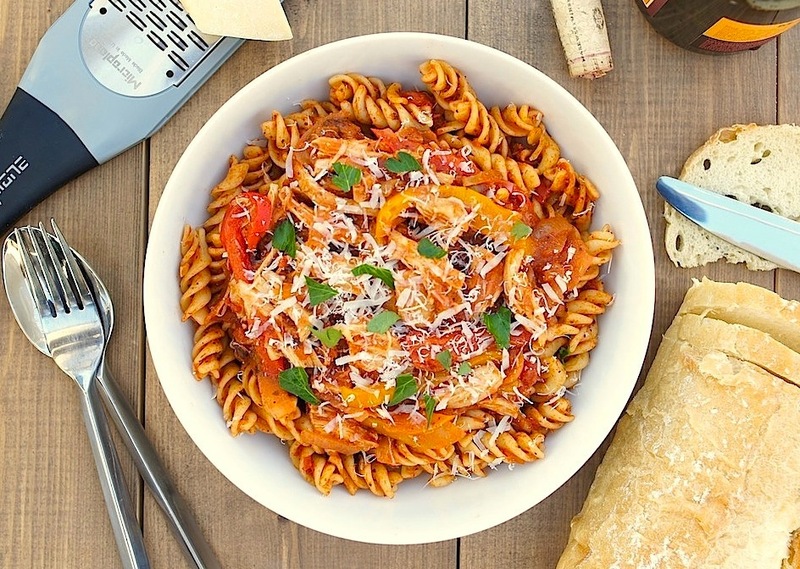 my mom used to make it for dinner regularly when i was growing up, + even though I hadn’t eaten it in years, i remembered loving the rich, veggie-packed, tomato-based sauce, served with tender chicken + lots of pasta. so, i decided to introduce my husband to it (he’d never tried it before) + make a version of my own at home. chicken cacciatore is traditionally made by slow-simmering or braising, either on the stovetop or in the oven, but after reading through some recipe ideas, i realized it would be a great meal to adapt for the slow-cooker. y’all know i can’t resist a good slow-cooker recipe! so, i combined a couple different recipes, got out my crock-pot, + got cookin’! and the result? juicy, tender pieces of chicken, rich, flavorful peppers + onions in a tangy, well-seasoned marinara-based sauce. serve it with one of my all-time favorite foods, pasta, + i’m pretty much in comfort food heaven. if you’re a slow-cooker lover like i am, you have to try this fantastic recipe! toss the chicken pieces with the italian seasoning, paprika, salt, pepper, + red pepper. set aside while you prep/chop the rest of the ingredients. note: you can certainly skip the next step of searing the chicken + partially cooking the vegetables, to save time. it *will* add lots of additional flavor to the dish, so if you have the extra time, it’s worth it! heat 1 tablespoon olive oil in a skillet over medium heat. add the seasoned chicken, + cook until chicken has seared slightly on all sides. transfer chicken to the slow-cooker. in the same pan, add 1 more tablespoon of olive oil. add the peppers, onion, + garlic to the pan + cook for about 5 minutes, until the vegetables have softened slightly. transfer the mixture to the slow-cooker. add the pasta sauce + bay leaf to the slow-cooker. (note: if you skipped the previous step of pre-searing/cooking the chicken + veggies, add the chicken, onions, peppers, garlic to the slow-cooker at this point, too) stir everything to combine. cover, + cook on low for 4-5 hours, until chicken is fall-apart tender. 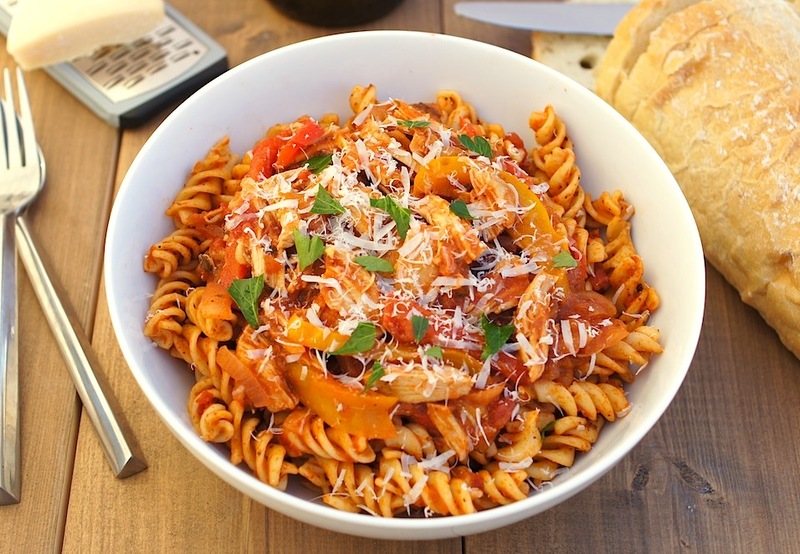 when ready to serve, toss the prepared pasta with a bit of the cacciatore sauce first, then top with the chicken, peppers + onion mixture. top with freshly-chopped parsley + parmesan cheese, if desired. Um, you knocked this one out of the park my dear and the photographs are STUNNING. This looks great, I haven’t had chicken cacciatore in ages! Good job you reminded me of it! Lovely! And Slow-cooker recipes are great, especially during the week for me! Happened across your website from a link at Housewife How To’s and am I ever happy I visited. Love using my slow cooker and will be trying this chicken dish very soon. I love Cacciatore and your recipe makes it so easy yet tasty! Yumm! One of my favorite meals and your version looks amazing! Amy, this recipe looks great! I love slow cooker recipes- you can get so much done while it’s cooking away. We’ll try this one soon for sure! This dish is fabulous! I make it all the time for my family and they all love it. I use a touchbmore seasoning then the recipe calls but either way it’s so yummy. I am SO thrilled to hear that, Jess! I almost always use more seasoning than recipes call for, so I totally understand. =) I’m so happy your family loves it!